Exploring a beach is always interesting. You never know what you may find from one day to the next, from one tide to the next, from one season to the next, from one step to the next! 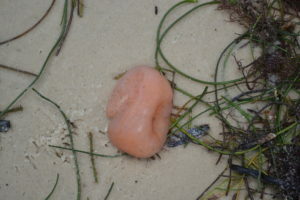 Beaches are an easily accessible margin of the “great ocean wilderness”. Simply taking a walk on a beach gives you a chance to discover some of the diversity of life that is mostly hidden under the water. Some of the best times to explore a beach are at times of low and mid tides. 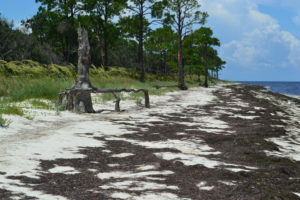 Depending on the location and time of year, the bits and pieces brought in by the tide will give a clue as to what lives just off shore in the sea grass beds, sand flats, and limestone outcrops. There may be elegant angelwing clam shells, colorful giant heart cockle shells, red and yellow sea whips, egg cases from whelks or skates, sponges, sea urchins, algae, conch shells, the empty molts of horse shoe crabs and shrimp discarded as they grow, or an interesting piece of driftwood, and that “blob on the beach” that doesn’t seem to be anything recognizable! The twice monthly extreme low tides that expose the sand and mud flats will be full of signs and trails of the critters that live just a few inches below the surface. Follow a winding trail to discover a tiny horse shoe crab burrowing into the sand looking for a meal of microalgae. Another trail will lead to the moon snail or a sand dollar. The sea stars are often stranded by the absence of water as well as several species of hermit crabs and snails. 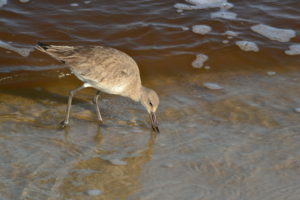 And of course, the shore birds are always present, poking their bills into the sand looking for worms and small crustaceans. They are the “original beachcomber”! Away from the water, at the higher reaches of the upper beach, you will find the specialists; species of flowers, trees and plants that withstand the extremes of sun, wind, salt, and storms. This is where the ”wrack line” lays, a collection of bits and pieces of everything that came in with the tide. If there are small holes in the sand, look closely to see a ghost crab hiding at the entrance to its burrow waiting for nightfall to venture down to the water’s edge. 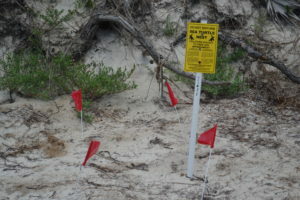 The night before, a sea turtle may have nested at the highest point from the water, and the “turtle krawl’ tr acks may still be visible, as well as the tracks of mammals such as raccoons, deer, wild pigs, and maybe the elusive Florida black bear. The list of what you may discover is endless, and all it takes is the desire to explore and ‘get a little sand between your toes’. 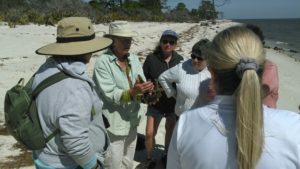 Explore the nearby beaches of the ‘Wilderness Coast’ with GSML naturalist and certified Green Guide Debbi Clifford. In an easy 2-3 hour walk, learn about the natural history of local shore life: shells, critters, plants, and that strange ‘blob on the beach’. Participants should bring water, dress for the weather, wear water/beach shoes, hat, bring sunscreen/insect repellent as needed. 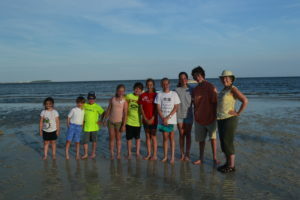 Debbi has been exploring the beaches of Wakulla & Franklin counties for the past 25+ years as a marine life collector for Gulf Specimen Marine Lab in Panacea, FL. She is a certified Green Guide and a member of the Florida Green Guide Association.